Printer Canadian Bank Note Company, Limited. In the delicate lines that appear behind the legendary hockey players featured on this year's NHL All-Stars stamps, you can almost hear the crunch of skate blades carving through ice. The skatework tracery is a subtle new design element introduced by Stéphane Huot for this sixth and final edition of the stamp series. "Every year it's a challenge to do something new while keeping the same basic structure and design elements," he says. 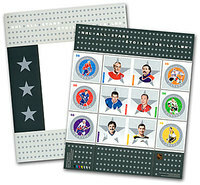 This year, the six domestic rate (50¢) stamps in the set feature on-ice images of another six hockey stars from the NHL's past: Henri Richard, Grant Fuhr, Allan Stanley, Pierre Pilote, Bryan Trottier, and John Bucyk. The familiar design elements that have given consistency to this established series return again - puck-shaped -circles surrounding the players, elegant typography, and player portraits that accompany the stamps. What distinguishes this year's presentation is the glint of silver, which hints at the speed of those flashing skate blades. Against a border of dark -metallic grey, a motif of running stars aligned in rows frames the souvenir sheet and its folder. 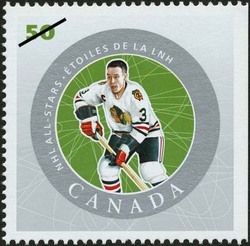 On the stamps, the players are encircled in metallic silver. The stamps are printed with seven colours, including these metallic inks, but the overall effect is somewhat muted. "I did a lot of drawings this year to explore various aesthetic approaches," says Huot. "I arrived at this tone-on-tone look that's a bit more sober, but charged with atmosphere." "It's a classic look, quite different from last year's bright orange, but no less dramatic," agrees Alain Leduc, Manager, Design and Production at Canada Post. Another change is less evident at first glance. The players themselves are represented very differently this year, in a more realistic, photographic style than in the past. For the previous five years of the series, illustrations for the stamps were individually painted by artist Charles Vinh. Because Vinh was unavailable this year, a new artist took over, with a new approach. François Escalmel began with actual photographs of each player in action, scanned them, then digitally recreated them. The results are crisp, sharp and very life-like. "It's important to recognize the talent behind the computer tools," says Leduc. "We began with original photos from various eras, of different qualities and sizes, some black and white, some colour. But to reproduce them together, we needed six images of similar quality, with equal colour values. Escalmel worked in layers on the computer, balancing light and shadow, equalizing shades of white, sometimes adding colour, or even adding details that might have been missing in the original, because they were blocked by another player, for example. He actually retouched these old photos to such an extent that they became totally new images." As in the past four years, the player portraits that accompany the stamps were produced from original photos digitally enhanced in a similar manner, by illustrator Pierre Rousseau. "This will be the last year we issue stamps in this series," says Leduc, who notes that this latest edition may be of particular interest to both collectors and hockey fans as a result. The lineup of stars on this year's souvenir sheet and booklet panel recalls the many star players the series has brought into the homes of Canadians over the past six years, a miniature hall of fame they can enjoy all year round. Canada Post Corporation. 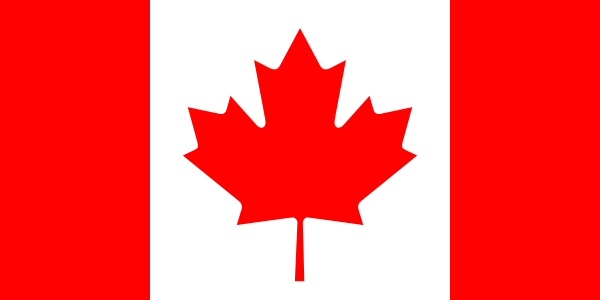 Canada's Stamp Details, Vol. 14, No. 1, 2005, p. 16-17.